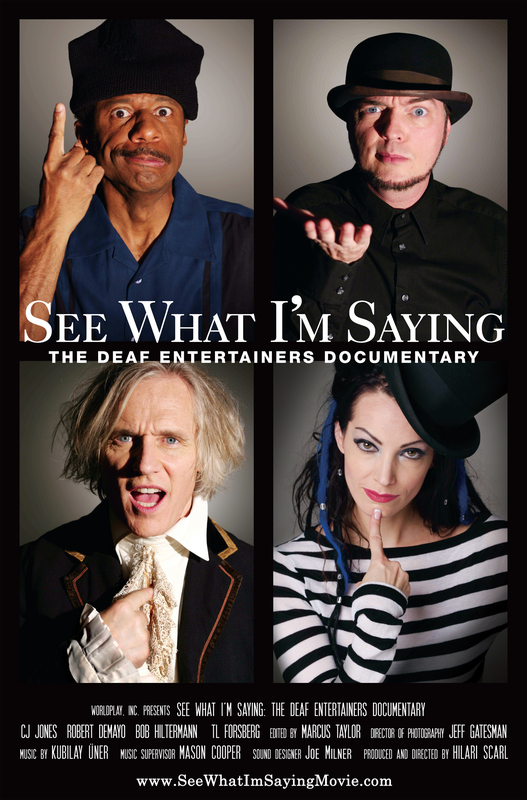 “ ee What I’m Saying” is a documentary that was made about a year in the life of four different Deaf performers: C. J. Jones the comedian, Bob Hiltermann of the band Beethoven’s Nightmare, T. L. Forsberg the singer, and Robert DeMayo the actor. It covers all their disappointments and successes throughout the year in trying to become better known for the things they love to do. C. J. Jones, a huge celebrity in the Deaf world, tries again and again to break through into the mainstream hearing culture but is constantly rebuffed. Bob Hiltermann has been teaching for two years, and feels the need to get the band together for one more show so he can be a rockstar at least once more before he dies. T. L Forsberg tries to find her place in the Deaf world even though many people look down on her because she can pass as hearing, has a singing career, and imperfect signing skills: they feel she isn’t Deaf enough. Even though Robert DeMayo is considered a premier actor and even teaches at Juliard, he finds it hard to get work; everything culminates for him when he is evicted from his apartment and is forced to live on the streets. The documentary premiered in Los Angeles on March 19th and is being shown exclusively at the Laemmle Sunset 5 in Hollywood until April 1st. After that, it goes to New York and then into wider circulation. I had been DYING to go see the movie. Everyone in my classes was talking about it and saying how amazing it was. I finally told my husband, Brian, that we were going whether he liked it or not, so we did. I can’t believe how much everyone was low-balling how great the documentary was. You wanted to cry with the performers through their difficulties and cheer with them through their successes. Even Brian, who knows no sign and nothing about Deaf Culture, found the movie incredibly inspiring. We both agreed that when Beethoven’s Nightmare puts on it’s next show, we will be there with bells on and nothing can keep us away; the concert they showed was just about the coolest thing I think I’ve ever seen. 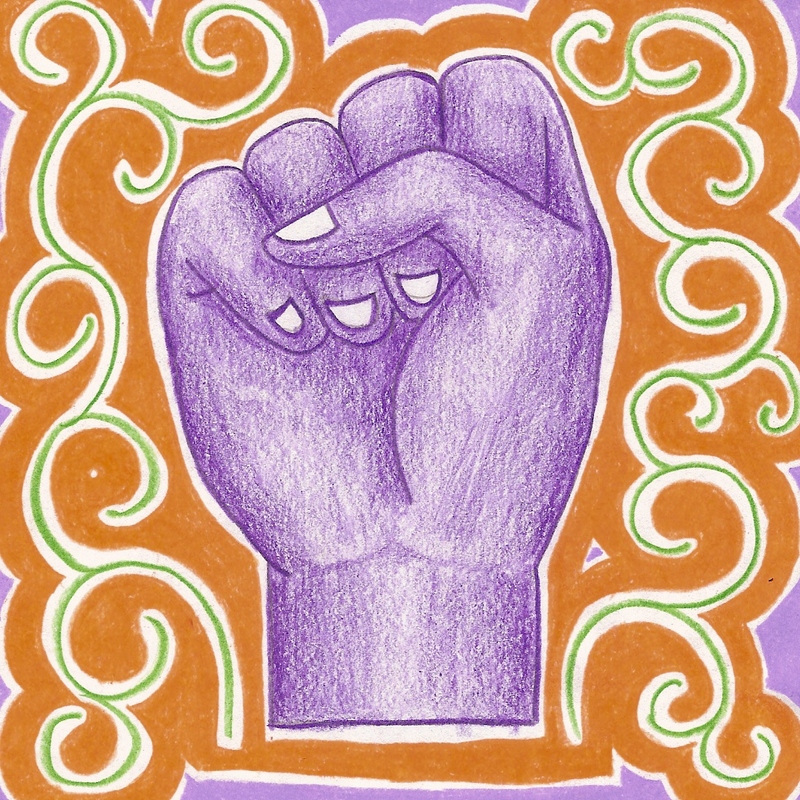 Little by little, Brian is learning more about Deaf Culture. I took him to the ASL Comedy Tour about a month ago and he loved it a lot. At one point during the movie, Keith Wann interprets for Robert DeMayo. It was really fun for Brian and I to turn to each other and say excitedly, “That’s Keith Wann!!”. While in theory I know how small the Deaf world is, it was highlighted a lot in this movie. The performers all know each other and work together constantly. The same people turn up over and over. While the movie was AMAZING, the best part was the ending. Brian turned to me before the lights came up and said, “Don’t look now, but the girl from the documentary is standing in the aisle right behind us!” T. L., Bob, and the director Hilari Scarl all showed up to answer questions at the end. It was really great to meet everyone!! We bought a Beethoven’s Nightmare CD, T. L.’s newest CD, and a See What I’m Saying poster which everyone was more than happy to sign for me. It was crazy, because you get all star-struck seeing what amazing artists these people are on the screen and then their right in front of you. I’m sorry to say that my ASL suffered a little bit of a breakdown due to nerves, but not too badly. It was a really great day, and I’m so happy that the open captioning on the film and the amazing volunteer interpreter made me able to share it all with Brian. I would strongly recommend that anyone who is able to should go see this film. It was a wonderful experience. The director was telling us all that the future success of the film relies on how many people go to see it in LA right now: I guess movie theaters in other big cities like to gauge how much interest there is before deciding to screen a film. So if you go to see it, not only will you be treating yourself to a really good time, you’ll be helping people in other cities have a really good time too. This was, without a doubt, the best time I’ve ever had seeing a movie!